Damn lies statistics can be used to manipulate the facts. My favourite sandwich spread has been minutely changed, to improve its consistency; or so the manufacturer thinks. It's slightly thicker; I had noticed the change but not thought much of it. Bored at lunch, I took a few minutes this week to scrutenise the label on my all time favourite spread made from a yeast extract; we'll call it M. And then compared it with a competitor, let's label it B. With a sigh of relief I noticed in the fine print it states that in a serving there are 0.0 trans isomers. Those are the bad cousins to Cis, made in the hydrogenation of fats. Well and good, but getting a different pair of spectacles, and a magnifying glass I notice something different; yes, the print is that fine, at least for rheumy, aging eyes. Do you take the time to read food labels periodically? You should, but don't believe everything you read; damn lies statistics abound to confuse and mislead you. Damn lies statistics are employed by food companies to conceal the truth about additives utilized in their products. From the company website concerning Marmite, I read further. "This concentrated yeast extract paste is 100% vegetarian and gluten free, with no added fat, salt or sugar. M is an excellent source of Vitamin B12, Riboflavin, Niacin and Folic Acid (every 8,5 g serving of M provides 55% of the RDA of Folic Acid) which is good news for pregnant women." Take special note of that little phrase, no added fat. The phrase 'lies, damn lies, and statistics' was first coined by that great humorist Mark Twain. Statistics have long been used to manipulate the truth by unscrupulous vendors. Thus you will see now that in all reliable research projects, the researchers distance themselves from any personal gain from the results of their research by a disclaimer. Sadly, for example, and this is controversial and I'm not convinced the jury is out on the subject, there's only one research document that shows that Glucosamine Chondroitin sulphate has benefits for arthritis sufferers that has not been financed by the companies producing the product. And plenty of independent research that indicates they don't help a jot. Rounding off figures is a useful technique we all use. I'll give you two examples. If a reporter stated that at the World Cup final there were 80 000 spectators present, you grasp they are not stating there were EXACTLY that number but ABOUT 80 000. Mathematically, depending on the number of decimal places you are rounding off to, it means there were between 76 000 and 84 000 spectators. One really isn't interested if there were 80 052 spectators. Unless you were collecting the money! You're at the supermarket and you buy five items for $5.45 + 3.05 + 6.95 + 18.25 + 2.99. Cashiers often make mistakes, sometimes big ones, so it's useful to know how much the bill is going to be; about, approximately. So we round the figures off. Mentally you quickly add 5 + 3 + 7 + 18 + 3. Provided your Grade 2 teacher did a good job, you would know the bill was going to be ABOUT $36. So, if the teller demands $41.69, you immediately suspect s/he has made a mistake, and you're about to be $5 poorer; so you scrutenise the till slip. Sure enough, that item for 6.95 was advertised at a reduced price, down from 11.95 but the company hadn't adjusted the fee on the computer. That incidentally is another way that unscrupulous supermarkets use to cheat you; I'm often convinced it's done deliberately. However, rounding off of figures can sometimes only be described as damn lies statistics. It's deliberately misleading in order to sneakily pull the wool over your eyes. So, having enjoyed, absolutely loved, Marmite for all of my 62 years, for the first time I read the label. Whew, a relief: 0.0 g trans-fat per helping. Wait, if there is 0.1g /100g added trans fat, how can there be ZERO, NONE per serving? Mathematically speaking, 0.0 means somewhere between 0.00 and 0.04. In reality, about 20% of the fat in Marmite consists of trans isomers. Bad stuff. And now being suspicious of their questionable reporting, they may well have rounded off 0.14g to 0.1g meaning nearly 30% is trans; see here how I've rounded off the figures to exaggerate to my cause! That should really be 28%. And if they are really dishonest, they may have rounded off 0.19 to 0.1. We just don't know. The figures don't matter; what we do know is that there is a substantial amount of trans fat in Marmite, and their 0.0g trans fat per helping is just so much lies, damn lies statistics. Hydrogenated foods are an anathema to the human body; they contain totally foreign substances that are known to cause cancer. Adding grist to the mill can you spot something further in their specious reporting? Trans isomers do not exist in nature. It's a foreign chemical to the body. You certainly won't find any in mushrooms. So, if about 20 to 28 percent of the fat in Marmite consists of trans isomers, then hydrogenated oil must have been added. Firstly, they think the public is gullible, and they can lead us by the nose. I don't trust food companies, full stop, and when they are being deliberately dishonest, then I hate them. Secondly, as far as trans isomers are concerned, the nerves of your body are coated with fat. Without that myelin sheath they can't conduct impulses normally. And in the last century we have an epidemic of nerve conduction sicknesses, like MS, ALS, motor neuron disease, plus Alzheimers; and the auto immune diseases where your body takes a serious dislike to some foreign chemicals and starts attacking your own tissues. And in cardiovascular diseases where foreign fats start clogging the arteries. I don't entirely buy into the cholesterol story; our forefathers ate plenty of animal fats, but heart disease was virtually unknown until the last hundred years. It's the unsaturated fats, and the hydrogenated fats (the trans fats) that have taken off in modern man's diet, just as we've seen these these nasty diseases escalating logarithmically. I'll probably go on eating product Marmite despite their lies, damn lies and statistics. 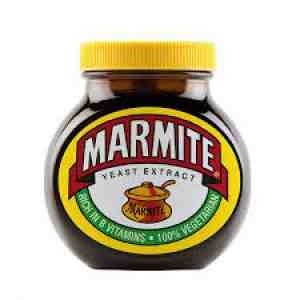 When I was weaned, Marmite was probably one of the first spreads used on my bread crusts! However, that was more than 60 years ago, and I'll bet it didn't contain a drop of added hydrogenated fat. Along with raw honey from my grandfather's hives I was brought up on natural foods. But I have less trust now in all the products made by this company (and they are big), and I'll eat rather less marmite, and I'll stick to my resolution to get my fats from the healthy fats that we KNOW are good: From fish, from the olive and avocados, nuts and seeds. And I keep hunting for cold pressed oils... it's the solvent extraction that spoils many of the other seed oils, like sunflower and canola. The exception is olive oil; it's cold pressed, as are some nut oils like macadamia; read the labels, and don't necessarily believe everything you read there. Yes, I'm a skeptic. In short, healthy fat means healthy nerves, and that's important to a chiropractor. And to you... so I still choose butter, in moderation, over margarine which mostly is fifty percent hydrogenated fat. There are exceptions. Update: It's now nearly 10 years since I wrote this page. The various companies that manufacture Marmite no longer report the percentage of trans fats; they've got sneaky, and whether they no longer add them is a moot point. Let's be clear about it, though; trans fats cause atherosclerosis of the linings of arteries by the same mechanism as a diet high in cholesterol: both trans fats and cholesterol suppress transforming growth factor responsiveness in the endothelium of arteries. You'll find that in J Nutr Biochem 2011. It's the main cause of high blood pressure and stroke. 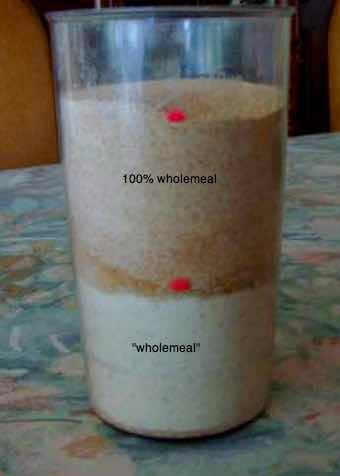 These are both 'wholemeal'. 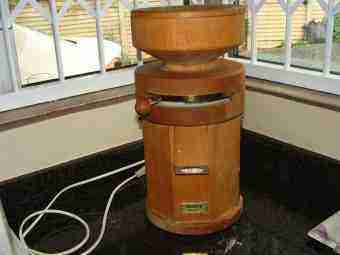 One of them comes directly from our Hawo wheat grinder and has all the goodies; none of the bran or germ has been removed. The other is from a miller; the packet describes it as wholemeal too, but they are chalk and cheese. Food manufacturers use all kinds of deception, damn lies and statistics to confuse and confound us. One of these is rich in the lignans that prevent breast cancer, has all the vitamin E and other phytochemicals that enable us to enjoy sparkling good health. The other is counterfeit. In research that I hope to start for an MSc I will be trying to show that failed hip surgery is (in part?) due to a sacroiliac joint fixation? And yes, I'll be very disappointed if my theory is not proved correct. But damn lies statistics? Never! 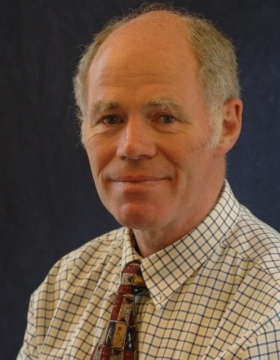 Bernard Preston is a semi-retired chiropractor with a background in physics; he is passionate about preserving our environment for our children's children. He collects and stores solar power and rainwater, grows organic fruit and vegetables, keeps chickens and bees. He is the author of four books. Yes, I too am peddling a product, I hope with rather more integrity than food companies; and it's not one iota of damn lies statistics when I say that not one person has reported they don't like one or more of them. My first three books were written to fill a gap in the market; there's no literature about chiropractic in the book shops. If you want to find out more about chiropractic, not in a hard, factual way, but in light, humorous literature, then I guarantee you'll love books like Bats in my Belfry. Enjoy it on your tablet for a song. The factual stuff you'll find at our sister site, Chiropractic Help; it gets an amazing third of a million hits per month; find out about specific conditions that you think perhaps could be helped with chiropractic. Did you find this page useful? Then perhaps forward DAMN LIES STATISTICS to a fellow food- and bookworm.